[Editors note: this post was prepared for both our website and NiCHE-Canada.org where it was published on Monday, November 28, 2016]. The dustbowl years on the Canadian prairies live on in the imaginations and landscapes of Western Canadians. Elderly survivors might still leave teacups upside down on saucers, as they did in the 1930s when dust settled everywhere in a household. Treebelts hastily planted on farms to reduce wind erosion have now become mature stands. In southern Saskatchewan, when a dry spell stretches over two seasons, farmers begin to scour again their holdings. Well aware of what happened in the 1930s, they look for the “hardpan” emerging from soils starting to shift and blow on their land. The dustbowl of the 1930s might have ended over eighty years ago, but many western Canadians still watch for its return. 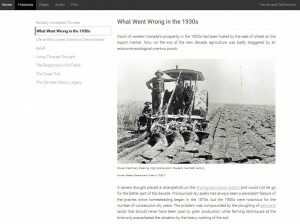 The multi-media website, Climate and Change: Making Sense of the Dustbowl Years on the Canadian Prairies was launched in September 2016 to provide a more robust explanation for one of the most significant episodes in the environmental history of Canada in the twentieth century. Environmental history examines the ongoing relationships between humans and their environments. 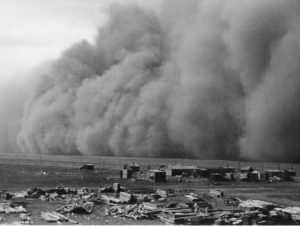 The 1930s dustbowl years can be viewed as both a relatively short-term event, as well as a part of the longue-durée climate history of the Great Plains. Normal and abnormal at once, the drought can be studied for dustbowl social and economic outcomes; the ways western science hastily adapted itself to solve perceived problems; or how humans responded emotionally — rationally and irrationally — to an environmental crisis. From our respective institutions (the Universities of Calgary, Alberta and Saskatchewan), we sought to develop a website to guide educators and students toward a better understanding of the events of the 1930s. Uniting scientific explanations, images, maps, audio, narrative interpretation, and newly-available video, Climate and Change seeks to assist those interested in Canadian history (teachers, students, the public, and ‘dust bowl’ survivors and their descendants) in developing a greater appreciation of what happened on the Canadian prairie in the 1930s and how humans responded to this episode in the history of “reliably unreliable” climate in the Great Plains. Climate and Change didn’t begin as a website. Rather, the original intent was to publish a standard printed anthology of primary sources and academic secondary articles that could serve undergraduate and graduate students at university; maybe it would also be read by the general public. We were excited at the prospect of producing a synthesis building on recent scholarship focused on the human and environmental histories of the Canadian prairies in the 1930s. But we soon became interested in exploring how a web platform might present different sorts of opportunities. Perhaps students and the interested public could encounter directly some of the diverse sources historians have used in making sense of the environmental history of the 1930s? Shifting from textbook to website was far more complicated than buying a domain name. The process prompted developers to reflect on the affordances and challenges of presenting historical interpretations on the internet. Web-based platforms demand succinct narrative. They don’t read like typical academic articles or books. The act of turning web “pages” is nothing like turning pages in a book or an article: a website’s structure works in different ways on a reader’s imagination. In the end, we sought to balance the affordances of the internet with the imperatives of historical interpretations aimed at a broad audience. A general introduction leads into explorations of six key “histories”. Each “history” both stands alone and aims to contribute to a richer understanding of prairie climate history. Each is intended to introduce readers from diverse backgrounds – from elementary to university students, to members of the general public – to a more complex perspective on the dustbowl years. The “histories” flow, then, from the long story of climate in the Great Plains; to the environmental and economic crisis in 1929-30; to the adaptations made on the ground after crops collapsed; to the then-radical measure of providing widely relief; to the war against grasshoppers that invaded the fabric of life in the west; to adaptive agricultural technique and farming, to the “Great Trek” of farmers who chose to abandon everything and move, usually north, from the dry plains. The last “history” reveals the legacy of the dustbowl years. Climate and Change includes audio and video sources that have not previously been widely available. As part of his research on the 1930s, former journalist and public historian James Gray recorded a set of interviews with key figures involved in responding to the drought emergency. These interviews would later form the core of Gray’s influential book on the dustbowl, Men Against the Desert. Many of Gray’s informants were government scientists and administrators who had worked to address the problem of prairie desertification. Some helped organize community pastures; others helped direct the droves of families moving away from the dry dustbowl areas of Saskatchewan to more promising environs. Climate and Change also includes the a film titled Dustbowl Dividend, by Cherry Film Productions Limited, using footage shot by Evelyn and Lawrence Cherry during their professional film making careers in Saskatchewan. The film offers both a window on evolving prairie agricultural practices, and an example of how the dustbowl was remembered in the late 1960s, when the film was made. 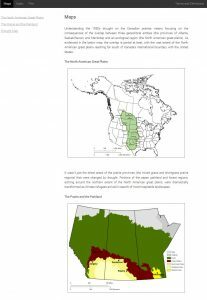 Dustbowl Dividend is available in two ways: in complete form, and also in small sections that complement the themes explored in particular sections of the website. Notably, the Gray interviews are also available both in their entirety and in small sections. Materials are presented in these ways to offer a wider array of potential uses. 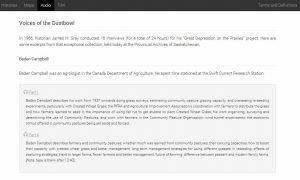 Both the Gray interviews and Dustbowl Dividend are today held by the Provincial Archives of Saskatchewan. Climate and Change makes them widely available to interested parties beyond Regina.